Maryland Vision Center offers patients in and around Frederick and the Baltimore area access to advanced laser cataract surgery. At the practice, Dr. Thadani is a leading provider of laser cataract surgery and treatment. Cataracts are areas of cloudiness in the eye’s lens which hinder the passage of light to the retina. The condition is not painful but can cause various issues with vision. When light cannot get to the retina because of a cataract, there are no messages sent to the brain. Aging and light exposure can cause a person to develop cataracts. They have also been known to develop as a result of an injury to the eye, after dealing with an eye disease, after using certain medications, and can result from diabetes. 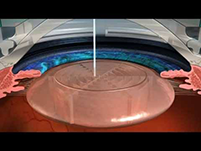 What is Advanced Laser Cataract Surgery? When cataracts become severe and interfere with a person’s daily life, surgery is usually used to address the issue. Laser cataracts surgery uses a femtosecond laser to accurately and precisely remove the cataract. During the procedure, the laser will be used to create a corneal incision. The incision and procedure will be mapped out using a 3D image of the eye known as an optical coherence tomography or OCT. This technology helps ensure that the incision is self-sealing and reduces the chance of infection. To gain access to the cataract, the eye’s capsule is removed in a step referred to as the capsulotomy. This allows the surgeon to create incisions with the laser, resulting in a significantly high degree of precision. Imaging systems provides both real-time video as well as three-dimensional visualization, enabling a custom design treatment plan that is individually tailored for your eyes The laser is then used to soften the cataract and break it up so it can be removed. The artificial lens is then placed and the procedure is complete. Our surgical team offers cataract surgery without the need for stitches, needles or patches. Cataract surgery is performed in an outpatient setting under mild sedation. This allows for faster recovery and minimal downtime. Cataracts are removed using the most technologically advanced surgical options available for cataract removal including the Centurion Vision System and the Zeiss Lumera Microsope.